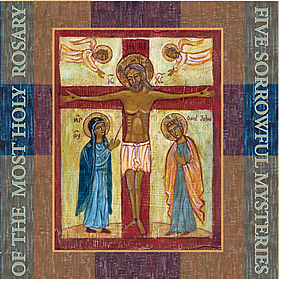 This 60-minute compact disc contains a beautifully-produced recording of His Excellency, Bishop René H. Gracida, praying the Sorrowful Mysteries of the Rosary. Also included are reflections and meditations (two for each decade). In the background, sacred music is played. Also included are pieces in honor of the Blessed Virgin Mary and St. Mary Magdalen, who stood at the foot of the Cross. Sacred music played on this CD comes from various sources, including Sacred Music Colloquium XIX .